Everything except for loading the car is done for the meeting in Indianapolis. I am so glad I can drive up. It took much longer than I expected to get the photos transferred to my iPad in the order I wanted them and to put together the yarn kits. I am hoping that all my preparations make the classes smoother. I am disappointed by the quality of the copying of the handouts for the Finishing Class so I have given the students the option of having the actual files. So many have tablets now they can load the files there or print out the offending pages in color. I won't be making a blog entry next week as I will be in Indianapolis. Things are still pretty slow but I did get a few lessons to review. I can review lessons up to Monday, the 15th. After that I will be in Indianapolis until the 21st. I teach until noon and then will be driving home. I can process course orders as I will have my iPad with me. Last week the tip was about how to pick up stitches along a horizontal edge. 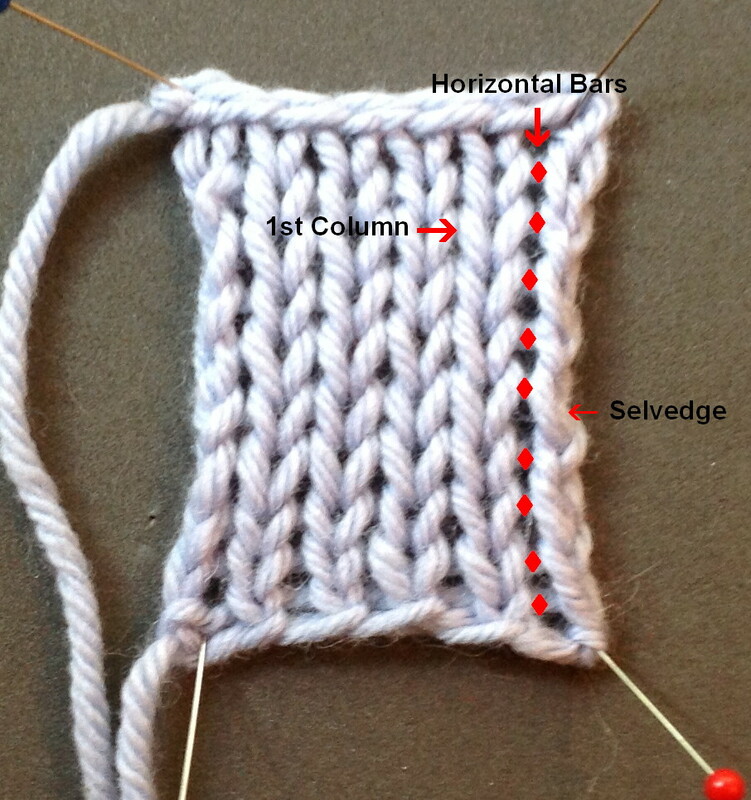 This week's tip is about how to pick up stitches along a vertical, (or selvedge) edge. 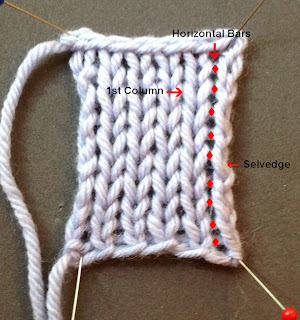 Pick up stitches in the spaces between the horizontal bars between the selvedge stitch and the first column of stitches. The difficulty in vertical bands isn't where to pick up the stitches but how many stitches to pick up. Unlike horizontal edges where one stitch is picked up for every column of stitches, you must determine a ratio for picking up stitches. The reason for this is that there are more rows in an inch that there are stitches. For example, in the photograph below there are 4 stitches in and inch and 5 rows. If you pick up one stitch for every row, it might ruffle (more about that later.) If you look in reference books, they generally say to pick up 4 stitches for every 5 rows or 3 stitches for every 4 rows or some variation of that ratio. 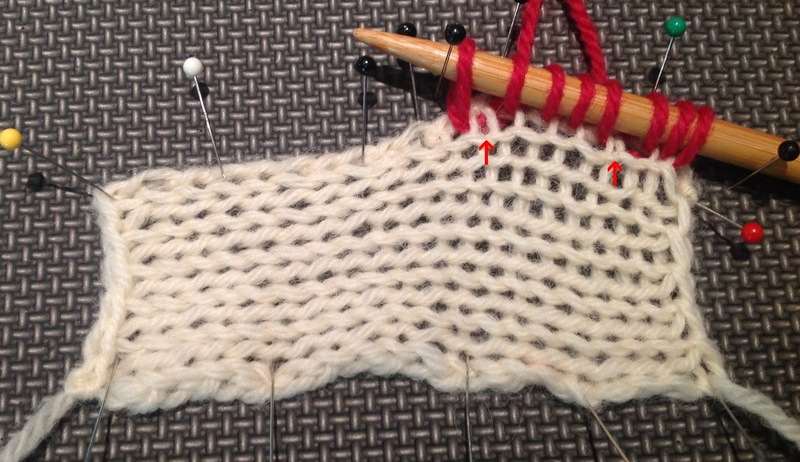 In the photograph below, the 4 stitches for 5 row ratio works. The Xs mark where there are two horizontal bars between the pick up stitches. This generally works but not always. You should consider the gauge of the stitch patterns of the band and of the body of the piece as well. 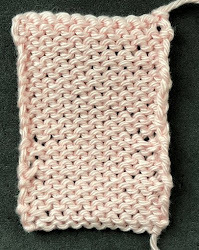 For example, if the body is stockinette stitch and the band is K2P2, you might have to vary the ratio a bit. You don't want a ruffled band but you don't want one that is too narrow either. The upshot of picking up stitches along a vertical edges is that there is no one rule that applies to all bands. 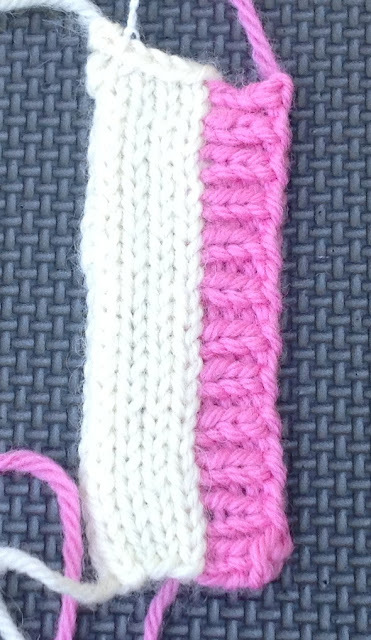 I recommend saving the gauge swatch and using it to practice various ratios. If you practice on the actual garment, you run the risk of stretching out the stitches. 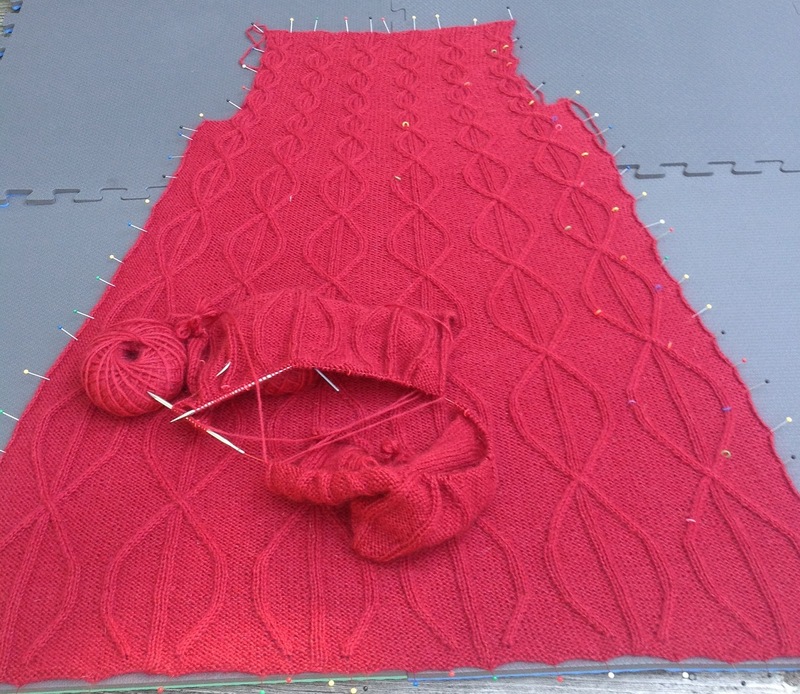 It is better to work out the details on a separate swatch. Salon will be on Saturday from 1:30-3:20. There won't be a salon next week as I will be in Indianapolis. I didn't knit much this week. All of the typing and yarn winding really tired out my wrists. I still am recovering from the surgery to some extent. I did start the fronts and blocked the back. One of my students raised an interesting point. She wanted to know if I had done a swatch to check the drag. If you have ever knit a project like the Einstein coat which is all garter stitch, you have probably experienced this. The weight of the yarn and the stitch pattern tend to lengthen the piece. No, I did not test this but yes, I did think about it. Most knitters learn about this the hard way, as I did. When I knit a coat I am very particular about the fiber. I knit a coat a few years ago using Debbie Bliss Rialto which is a beautiful yarn but it is extremely heavy. The coat weighed a ton and it lengthened about 3 inches. For this reason I selected Rowan Kid Classic which is an amazing light yarn. Hello Arrenda, I have been reading your articles and patterns for many years now, and thought I would tell you that I appreciate the clarity of your writing. Your instructions have been a great help to me. I hope you make a complete recovery. Thank you, Rhonda G.